The latest Ford Fiesta ST hot hatch has been revealed which matches the performance of the brand’s current range-topping ST200 model. The new ST hits 62mph from rest in 6.7sec — 0.2sec faster than the outgoing Fiesta ST. 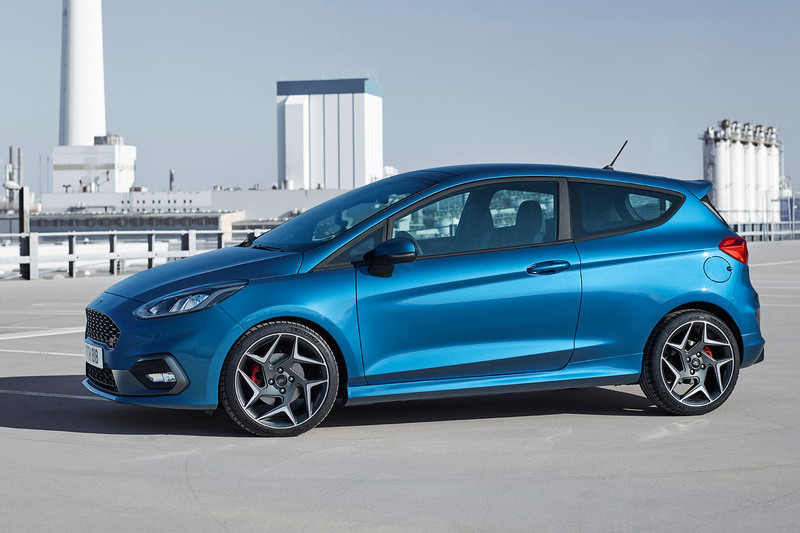 Unveiled officially at the Geneva motor show today, the Fiesta ST remains an important halo model for Ford, particularly in the UK, where its Fiesta supermini continues to dominate car sales. It is in its eighth consecutive year at the top of the car sales rankings. 2017 Ford Fiesta ST: will a three-pot do the job? The third-generation Fiesta ST is the first to feature Ford’s new, 197bhp three-cylinder 1.5-litre Ecoboost petrol engine. It also introduces three drive modes which adjust engine, steering and stability controls. There are more customisation options than before, too. “Next-generation Fiesta ST customers will benefit from innovations developed by Ford Performance for the Ford GT supercar and Focus RS hot hatch, including fuel injection and drive mode technologies,” said Ford Performance boss Dave Pericak. Ford of Europe product boss Joe Bakaj added that the new model will “deliver the most versatile, fun, engaging and rewarding Fiesta ST driving experience yet”. Sitting alongside the well-received 1.0-litre Ecoboost used across the Ford range, the 1.5-litre engine has 214lb ft and uses turbocharging, high-pressure fuel injection and twin independent variable cam timing, all of which delivers “optimised performance and fuel efficiency”, according to Ford. A new turbocharger features an optimised turbine design to build boost pressure more quickly and to minimise lag, according to the car maker. The engine also features cylinder deactivation technology, a world first for a three-cylinder engine but increasingly common on bigger engines and used frequently on Volkswagen Group TSI petrol units. The move will help improve fuel efficiency by shutting down one cylinder when full capacity power isn’t needed, such as when cruising with little demand on the engine. Matthias Tonn, chief programme engineer of the car said: "The new 1.5 Ecoboost engine is the new core, the heart of the car. It's so much more responsive, more agile, than the current car. "Efficiency is a big part of this car. The CO2 is down at 114g/km, and it has the same performance. It's a very agile engine also, has great responsiveness, new calibration, a new way to ignite the fuel. The engine is more direct and lively. Tonn added: "There is no turbo lag now. We don't even talk about it. You press a button [the throttle] and the car goes. Software calibration and processor speeds are all much quicker. It's fun to drive, and will have a bigger grin on it than the old Fiesta ST."
A major new addition for the Fiesta ST is the introduction of three drive modes: Normal, Sport and Track. Normal mode is the default setting, where all systems, including the traction control and electronic stability control (ESC), are configured to give a natural driving feel. In Sport mode, engine mapping and throttle pedal response are sharpened and there’s more “driving feedback”, says Ford. Sport mode also creates more noise, through Ford’s Electronic Sound Enhancement technology and the opening of the active exhaust noise control valve, both of which heighten the exhaust note and engine noise within the cabin. In Track mode, Ford says all of the vehicle’s dynamics are tuned for the fastest possible lap times, traction control is disabled and electronic stability control is set to wide-slip mode for circuit driving. ESC offers drivers a choice of three modes — full system intervention, wide-slip mode with limited intervention and full system deactivation. The ST’s chassis also uses torque vectoring to improve roadholding and reduce understeer by applying braking force to the inside front wheel when cornering. Tonn commented: "We have spent a lot of time on the suspension and chassis, and found a new way to set it up." He added that there has been a lot of work to finesse the sound. "We have the active exhaust from the Mustang. On low rpm, the exhaust valves open. At higher rpm, there's a sound enhancement system that amplifies the sound. This used to be digital sounding, but faster processors now make it sound more alive." "The benchmark was the old ST, then the ST200 came long. It has been a very good basis for this." Available in three-door and five-door versions, echoing the current ST, the car’s exterior design includes a “race car-inspired” mesh grille, large rear wing and exclusive 18in alloy wheels, as well as a new Liquid Blue paint colour. Inside, there are Recaro seats and a flat-bottomed steering wheel. Customers can choose from a range of trims for the gearlever, steering wheel and door pulls, as well as a number of styling packs. Ford’s latest infotainment system, Sync3, also features. It uses a tablet-like touchscreen up to 8.0in in size that can be operated with pinch and swipe gestures. The ST will also offer a high-end B&O Play sound system, first announced on the standard Fiesta late last year. The new Fiesta ST goes on sale early next year and is expected to be priced slightly higher than the outgoing model, which starts at £18,145. Why have they put a picture up of the previous gen Fiesta? Must admit that I too thought this was the current model, but it seems it is actually the all new one. I wonder how much is actually new for this generation, or have Ford done what GM did with the Corsa and just done an extensive facelift? [quote=kendrick89]Apart from the back! What the hell were they thinking? It looks like an MPV! Really dislike the rear its lost all its distinctive features[/quote] I agree, the back end is now hopelessly anodyne and anonymous. Have Ford learned nothing from the Ecosport?! I'm not sold on the dashboard either - and not another flat-bottomed steering wheel, please! Really think the ST badge on the back should be a lot bigger..
RS model on the cards!? Ford creating room for a RS version at a later date me thinks. Watch this space- VW, Mini ,Peugeot etc. Any 5DR version of the ST in UK / Europe? (2) 197 Bhp must surely be enough. The Sierra Cosworth had 204 Bhp and was considered an astouding giant-killer of a car. (Yes, I know that was 30 years ago). Focus ST the reason it 'only' has 197bhp? While power isn't probably the end all and be all in a hot hatch, as 197bhp is still punchy for a supermini, since the first Fiesta ST was launched it has always been down on power compared to its rivals and this new model is no exception. But then I suspect the reason that has been the case over the years is that it'd come too close to the Focus ST when it comes to performance. And to give this new model 200bhp or more would mean it's not far shy of the current Focus ST.
Front end styling and the side view look nothing special but, ok for a modern supermini in these days when dull is best. Looks like the designers lost interest at the back end, however and just scaled down the S/C-Max. [quote=Bob Cholmondeley]Front end styling and the side view look nothing special but, ok for a modern supermini in these days when dull is best. Looks like the designers lost interest at the back end, however and just scaled down the S/C-Max. [/quote] The problem is that Ford is stuck with the 'wedge' look. Maybe Ford's marketing board thought wedge means 'edgy' & 'aggressive' whereas in reality it looks so 1990s. Citroen in its Cactus & C3 show that interesting styling can be reinvented for small cars.